The Task Management Template for Excel (To Do List Pro) allows the management of tasks for any type of project through the update and organizations of tasks by date, status, priority and custom category definitions. Project tasks can be quickly entered, organized and sorted for project status reporting and automatic reminder notifications can be configured to ensure that tasks are completed on time. Specify and change the number of days for automatic due date reminders. Customize sort ordering of tasks attributes including due date, priority, status, category and more. Apply customized color formatting to task characteristics such as overdue, complete and configured warnings. Define and add categories with descriptions. Automatic reminder notifications for overdue and upcoming tasks due to be completed. 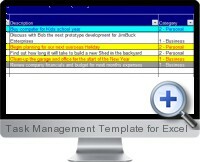 Simple and fast adding and removing of project tasks. Completed tasks automatically reformatted and moved to relevant section. Categories, statuses and priority definitions can be customized to fit project dynamics.